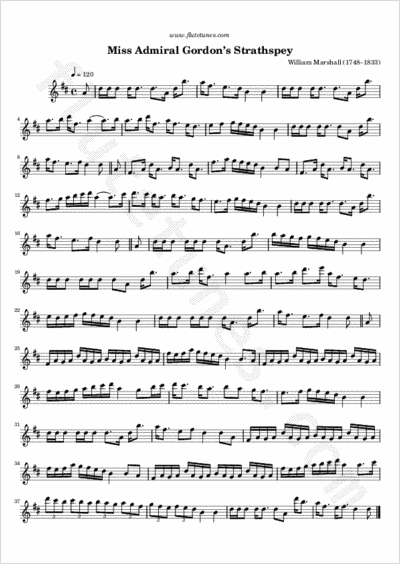 This is one of the first composed and most famous tunes by Scots fiddler William Marshall. It was written around 1775 in honor of Margaret Gordon, daughter of Admiral William Gordon. “Miss Admiral Gordon” was first published in Marshall's Strathspey Reels, in 1781. Its popularity is due in part to the fact that Robert Burns wrote one of his best songs to it, which begins: “Of a' the airts the wind can blaw”. The melody has been used for other songs, including a Canadian folksong, “The Scarborough Settlers' Lament”, and the Scottish song “The Scottish Settlers' Lament”.